We went out early this morning for this family's outdoor part of their session since one of the little boys gets to have a birthday party this afternoon! We actually had nice weather considering it could have been much colder and the boys had so much fun playing with all their trucks and showing them to me. Considering I have two, almost three, boys, this was a lot of fun for me to take a peek at what likely lies ahead for my own family! 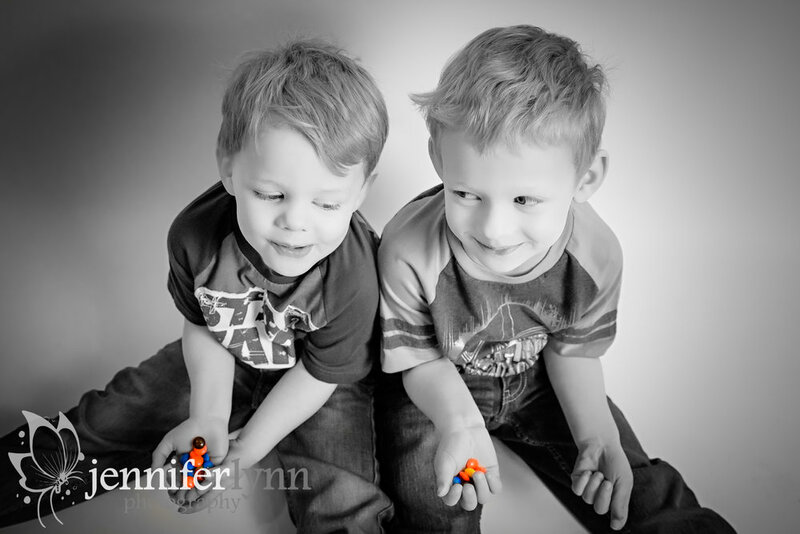 The brothers have so many neat trucks and I was able to capture their little personalities and concentrated expressions as they played. What a great idea by Mom to bring all these special toys! We did get cold after a little while so we finished up our session in the studio. They boys had special Legos they had built and showed me, then I got some great photos of them playing with colorful modeling clay and holding M&M's. Again, great ideas, Mom! The boys had such fun and I really enjoyed getting to preserve these special, real life, memories for this family.